The bright yellow block reminds me to peer into the mirror (*) before yanking the handle, regardless of which hand I’m using. Haven’t had any close calls yet, but practice makes perfect. If you don’t have a label maker, you can hang a tag on the handle. (*) Update: Yes, I should look over my shoulder, too. At least now I’m aware of the situation and don’t just open the door without thinking. One step at a time. This entry was posted on 2018-10-14, 07:52 and is filed under Oddities, Recumbent Bicycling. You can follow any responses to this entry through RSS 2.0. Both comments and pings are currently closed. I didn’t realize there was a name or technique applied for what should be common sense or general awareness. I’ve lived on campus and ridden bikes for years in similar busy areas and feel that I’m hyper aware of these things. So many people have not ridden bikes since reaching adulthood or are “so busy” while spending at least 50% of their time awake looking at a cell/smart phone. I live way out in the country now, although not far enough since all city noise is replaced with intentionally loud trucks belching black smoke, near continuous gunfire, or explosions from Tannerite explosive targets, but that’s another story. When I do get back to busy areas like college campuses, everything seems very tight-spaced with people darting from everywhere and in many cases not using cross walks. Naturally the density has increased since I was living there but smart phones weren’t around then as added distraction. So in short, I guess I have executed the “Dutch Reach” without realizing it. Maybe there should be a mandatory high school course or certification in reality and paying attention before you are allowed to drive as well as random driver’s license pulls that have a more stringent test for anyone at any age[?]. Is 53 too early to be considered old and grumpy about these things? We’ve sometimes driven through the area where I grew up and, although the roads I used to bike on are still there, I’d definitely be reluctant to ride ’em with today’s traffic. It’s no wonder kids-these-days don’t rides bikes. 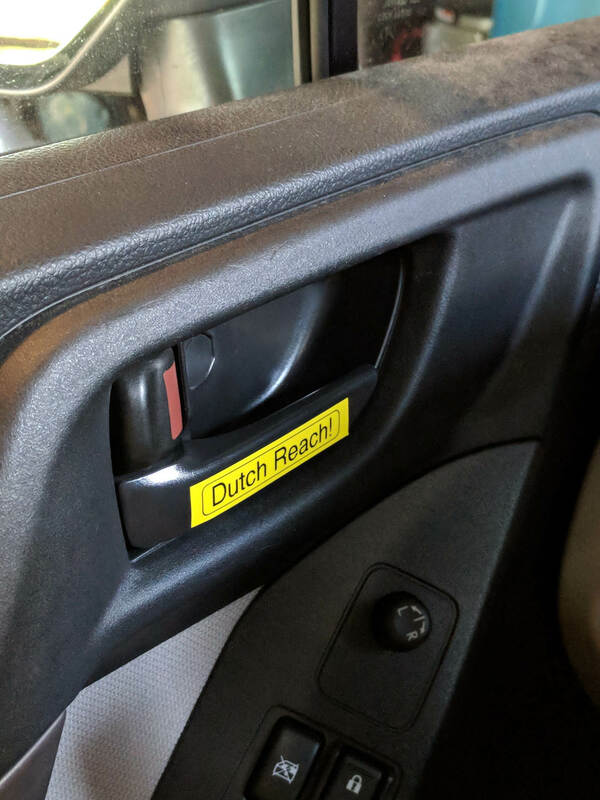 Being Dutch, I can’t say I’ve been taught this “Dutch reach,” at least not in the “use your right hand” sense in the video. However, who the @#$@# wouldn’t look over their shoulder to ensure it’s safe to open the door? Having seen folks step out of their car into traffic while peering at their phone, it’s reasonable to assume nobody looks before pulling the handle. We ride far from the door strike zone for well and good reason! Now, to get everybody trained up! Maybe self-driving cars will have cyclist / pedestrian detection built into their door-opening logic? Oh come now, Ed, you can do better than this. You have the super power of Technology! What I imagine is a pair of electrodes near the left side of the handle, which the user (you! or perhaps me too) would brush up against if they go to open the latch with their left hand. This would only give a mild shock, but enough to be noticed. But if they reach across with their right hand they will avoid these little ticklers, and open the door properly. With a little help from Pavlov we’ll all be opening the door properly in no time. When I’m walking I sometimes look up-and-left to see what’s behind me, expecting to find my helmet mirror out there in space. Obviously, I need a 3D printed mirror mount with threaded titanium inserts implanted in my skull?